Home » Houston Car Accident Lawyers » Merging Accident, Who is at Fault? When you’re merging onto a highway, who has the right of way? Who should yield? And if you get in an accident, who should pay? Merging onto busy freeways and highways requires the full attention and skill of a driver, and it calls for drivers merging and drivers already on the highway to be courteous and use common sense. On busy Texas highways during peak traffic hours, merging in and out of traffic can often be difficult, and is the source of many car accidents every year. Specifically, Section 541.061 states that while on a roadway with three or more lanes going in the same direction, a driver must yield to traffic on the left when entering from the right. Section 545.058 states that drivers can drive on the shoulder of a road in certain conditions, including while they’re preparing to merge into traffic. And Section 5414.154 sets the rules for when drivers need to yield when merging into traffic, even if there are no yield signs present. By looking at these laws in the context of individual accidents, we can help determine if you or the other driver are at fault in a merging accident. If failure to yield is the cause of the accident, you can recover different types of damages associated with the crash, including personal injury and property damage. Compensation can cover medical bills, short and long-term care, lost income, household expenses, vocational rehabilitation, and pain and suffering, depending on the nature of the accident. 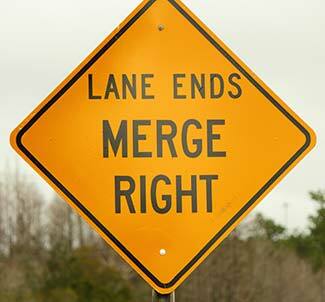 Immediately after you’re involved in an accident while merging onto another lane, you should stop if it’s safe. Ideally, you should turn on your hazard lights, look for the driver who hit you, and both stop at a place that’s safe for you to talk and exchange information. If the driver decides not to stop, don’t try to chase him or her. Instead, stop at a safe place and call the police. Once you’re stopped, exchange contact and insurance information with the person involved in the accident. Avoid saying anything about the accident itself or who you think is at fault, and avoid getting angry, even if you believe you had the right-of-way. Instead, call the police and wait for an accident report. At this time, it’s also a good idea to call your insurance company or agent to report the accident if you’re in the position to do so. While you’re waiting for the police to arrive, take photographs of the damage to your vehicle, check for any witnesses that may have witnessed the accident, and write down the time and location of the accident. This information will be useful when filing your claim and in the event you hire an attorney. If you were hurt in the accident and didn’t seek immediate medical treatment for your injuries, you should visit a doctor right away. This will ensure that you get the treatment you need and that you injuries will be documented. The other driver’s insurance company may call you to ask for a statement, but we recommend that you don’t say anything until you hire a lawyer. Insurance companies are notorious for wording questions in ways to set up the answers in their favor to help them avoid having to pay your damages.